According to Article 2(3) of the 1995 Constitution of the Republic of Bosnia and Herzegovina, all persons within the territory of Bosnia and Herzegovina shall enjoy human rights and fundamental freedoms including the right to life, the right not to be subjected to torture or to inhuman or degrading treatment or punishment, and the right to security. The Entities shall provide a safe and secure environment for all persons in their respective jurisdictions, by maintaining civilian law enforcement agencies operating in accordance with internationally recognized standards and with respect for the internationally recognized human rights and fundamental freedoms....Article 3(2), 1995 Constitution of the Republic of Bosnia and Herzegovina. There is no explicit regulation of the use of force by such law enforcement agencies. Article 27 of the 2004 Law on Police Officials regulates the use of force by police officers. They may only use for “when strictly necessary and only to the extent required in order to achieve a legitimate objective”.Art. 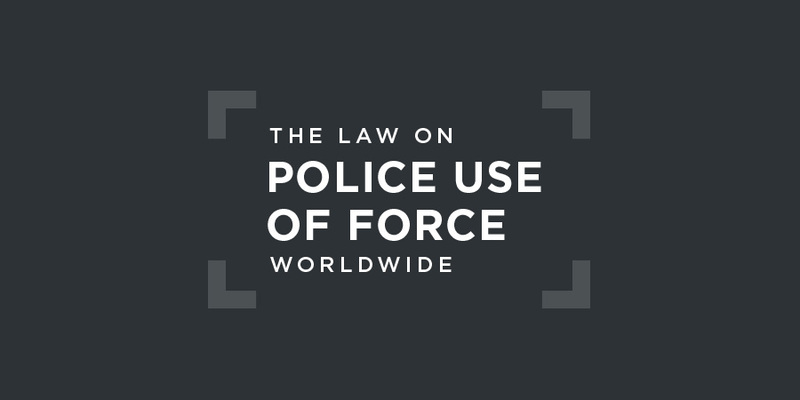 27(1), 2004 Law on Police Officials.Officers are entitled to use force “when necessary to protect human lives, repel an attack, to surmount resistance, to prevent escape”.Art. 27(2), 2004 Law on Police Officials.Officers must issue a warning before using force unless “it may endanger the safety of the police officials or another person or would be clearly inappropriate or pointless in the circumstances of the incident”.Art. 27(3), 2004 Law on Police Officials.Detailed regulations on the use of force are required to be issued by the Federal Ministry of the Interior. The Law stipulates that bodily force and batons "shall not be used against children, elderly persons, incapacitated persons including persons who are apparently seriously ill and women whose pregnancy is obvious, unless these persons directly endanger the life of a police official or other persons."Art. 28(1), 2004 Law on Police Officials. Firearms and special weapons may not be used only for the purpose of preventing a person from escape, except if that is the only way to divert the direct attack or danger or in the case of the escape of an apprehended person or a convicted person escaping from an institution for the execution of sanctions.Art. 28(2), 2004 Law on Police Officials. Thus, it would appear that fleeing prisoners, even if unarmed, may be fired upon if that is the only way to prevent their escape. This is not permitted by international law other than in a proximate and grave threat to life or an imminent threat of death or serious injury. Policing in BiH is overseen by the Directorate for the Coordination of Police Bodies of Bosnia and Herzegovina whose mission is “to serve the police and other relevant bodies in Bosnia and Herzegovina in the efficient execution of their responsibilities". The Office for Professional Standards conducts internal investigations into complaints of unlawful police use of force. Outside the realm of law enforcement agencies, the national human rights ombudsman oversees the investigation of complaints of human rights violations committed by any constituent part of the government, including law enforcement. In its 2015 report, the Human Rights Ombudsman dedicated a chapter to complaints regarding police actions. In its 2017 Concluding Observations on Bosnia and Herzegovina, the Human Rights Committee remained "concerned about reports of ill-treatment and harsh conditions in some police stations and detention facilities".... It also regretted the lack of information with respect to allegations of ill-treatment of detainees following demonstrations in February 2014. There has not been a case at the European Court of Human Rights concerning unlawful police use of force in Bosnia and Herzegovina. Details are not available of national or local prosecutions and convictions for unlawful police use of force.